In 1790 the Scotsman Robert Burns penned the poem “Tam O Shanter”. In the poem “Tam O Shanter” a farmer named Tam was riding his horse Meg home from the pub one night, drunk and his belly full of booze, when he spotted witches and warlocks dancing to the tune of the devil playing the bagpipes. He yells “Weel done, cutty-sark!” at the sight of a pretty young witch in a short dress, understandably putting his life in jeopardy to draw her attention. I mean, who wouldn’t try some smooth talk on a witch who keeps company with warlocks and, apparently, the devil? Needless to say she was not interested in poor Tam who was met with anger and chased away across the river Doon. Lesson learned, Tam. About 222 years later, Cutty Sark released the “Tam O Shanter” 25 Year Old blended Scotch whisky to celebrate Burns Night 2012. Cutty Sark needs no introduction. Having enjoyed its heyday in the 1960’s and 1970’s and famously being ordered by Joe Pesci’s character in Goodfellas, the brand is immortalized in popular culture. The problem is that at some stage in the 1980’s people began to prefer Johnnie Walker and Chivas Regal which led to a gradual decline in Cutty Sark’s market share. Today, Cutty Sark is a shadow of its former self but it appears a re-birth is on the cards thanks to some epic blending work and the use of some rich spicy malts which form part of the signature Cutty Sark style. 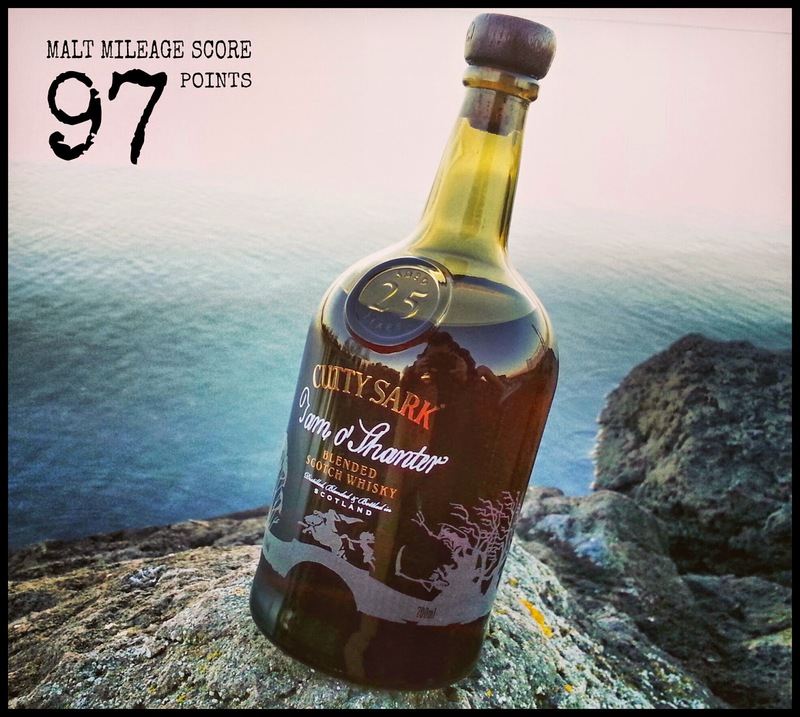 The Cutty Sark Tam O Shanter certainly showcases brilliant blending and some very old sherry matured malts that taste over 30 years old – a rare pleasure that respects tradition and yet thinks outside the box. This is by no means a simple blend. It clearly attempts to entertain, just as Robert Burns did so many years ago. Nose: Sherry, beautiful sherry, intermingles with dark chocolate, black roasted coffee beans, leather, preserved dark cherries and mild wood vanilla as grassy undercurrents carry hints of peat and a dry nuttiness typical of the magnificent dark Spanish wooded sherries – Oloroso in particular, being medium-dry. The malt whisky underpins the bouquet, with oily barley and that peaty hay note interacting beautifully with the wood and some mild anise seed. The sherry influence in this whisky is outstanding, a simply stunning example of a sherry matured whisky – a practice that is slowly being eroded by the explosion of bourbon matured whisky as sherry casks become increasingly rare (and expensive!) due to a decrease in sherry consumption. Taste: A smooth entry brings cocoa, coffee, dates and cherries, and then at mid-palate the flavours explode on the palate and progressively dry – sherry, chocolate, toffee, vanilla, burnt orange with hints of hay, nuts and dashes of Arabic coffee with cardamon and nutmeg all develop, and, as if under some spell, the character of the whisky suddenly reverses as the sweetness and spices begin to dominate into the finish. Finish: The finish is a delight. The sherry is both sweet and dry, with a bitter nip of wood and almond skin as cocoa lingers with the preserved dark cherries, anise seed and sweet picked ginger. A big fruitcake finish sits on the palate with these flavours – dazzling.